Scooper - Technology News: Could you soon fly an airplane with your mind? Could you soon learn Kung-fu like Keanu Reeves in The Matrix ? The idea might not be as crazy as it sounds. Geoffrey Ling, Professor of Neurology and Neuroscience at both Johns Hopkins and Uniformed Services University of the Health Sciences, and a member of the Global Future Council on Neurotechnologies and Brain Science, says we are on the brink of a revolution in mind technologies. Sooner than you think, you may be able to drive a car or even fly a plane with your mind. What is the state of neurotechnology and brain science today? Imagine we are at the very early stages of the original cellphone. In the 1980s, they were large bricks and all they could do is make phone calls. That’s sort of where we are with brain science. We can measure reliably certain signals associated with individual functions. We can see how to move an arm, or what is happening during a specific emotional state. We can measure those things fairly well. The technology is still bulky and expensive. It’s still not amenable for everyday use: normal people doing real things in real time. Much like the cellphone though, the progress is going to be staggering. We will learn to measure the signals better, and find more functionality associated with those signals. The innovation is going to explode. How will your council be contributing to the conversation? The most important thing is to increase global awareness. This should not belong to just a handful of nations or even a segment of those nations. This is going to be very empowering across societies. It will be a worldwide phenomenon. What we can do is create this awareness and explain the opportunities. Think about how brain technologies could impact the global economy. Telecommunications are already connecting the world in ways we could have never foreseen. Now take that a step further, and imagine a world where we could connect with our minds . It really isn’t so unrealistic. That is going to bring about a whole new level of efficiency and understanding. What mankind could achieve would be phenomenal. But in order to do that, it needs to happen worldwide, and the council can help to push that forward. What kind of things do you think we will be doing with our minds? Look at it this way: a hundred years ago this interview would have happened with pen and paper through letters. Think of how much detail is lost through that method of communication. We could turn out a meaningful dialogue, but the emotional content would be largely lost. Today we are having it on a telephone, so you have an added layer of understanding through my voice, my enthusiasm, how I say things. Then, if we have this conversation face to face, you can add even more detail. How my face looks as I speak, my hand gestures and so on. Now, imagine if we spoke brain to brain and you could actually feel how I was feeling, understand what it is I am trying to say. You would know exactly what i am trying to tell you. This technology could take human relationships to a whole new level. We could cross boundaries of language, understanding. Misunderstandings could be a thing of the past. We’re going to break down so many barriers that exist today. Were possibly looking at the next step of evolution. What are the key trends that we should be aware of? Developing technology is very important right now. That’s the enabler. Literally billions of dollars are being invested into neurotechnologies, the things that will help us understand the signals the brain uses. We’ve already made so much progress. We’ve been able to put probes in the human brain to move a robot arm. We’re now expanding on that to create the sense of touch. Research is being done to see if we can understand memory. Possibly we can make applications to fight depression, schizophrenia. In order to do all of this, data collection is very important. So we are also working on making storage more efficient. From there, we need to find ways to make all of this non-invasive, so we don’t need to be putting probes in people's heads. This is being worked on as we speak and it will be the next big breakthrough. Once you don’t need probes, you can begin to apply these technologies to everybody, not just patients. To get there we need the hard science. We still need to know more about electrical signals in the brain - which ones do what, where do they come and go from and what do that accomplish? From there on, the sky's the limit. So is this going to be like The Matrix ? Will I one day just download a language or Kung fu? OK, grant it, nowhere near the level of downloading a language. But there are already experiments in animals that show it is possible. In one experiment, scientists taught animals a certain task and measured how it’s brain functioned. They then took this neural ‘code’ and downloaded it in an animal that didn’t know the task at all, and it was able to do it. Going a step further, there have been experiments with humans lead by Michael Kahana which show there are neural codes directly associated with direction. He was able to stimulate people to perform a task because they have the directional cues downloaded for them. And that’s still not all. Using neurotechnology, we have already been able to take a woman who is quadriplegic and have her fly an F-35 fighter jet using only her mind. So if that is what is happening now, where do you think we’ll be by 2030? Who can predict it? Just look at applications today. Ten years ago no one would have predicted Uber. I think we will have a non-invasive sensor. You'll put on a skullcap like a hat and you will then get in your car, you'll think about driving and you'll just go. You will no longer interact with your hands and feet. Or perhaps devices will augment your ability to use your hands and feet. We won't have the need to talk on the phone, we’ll wear a device and communicate with our minds. 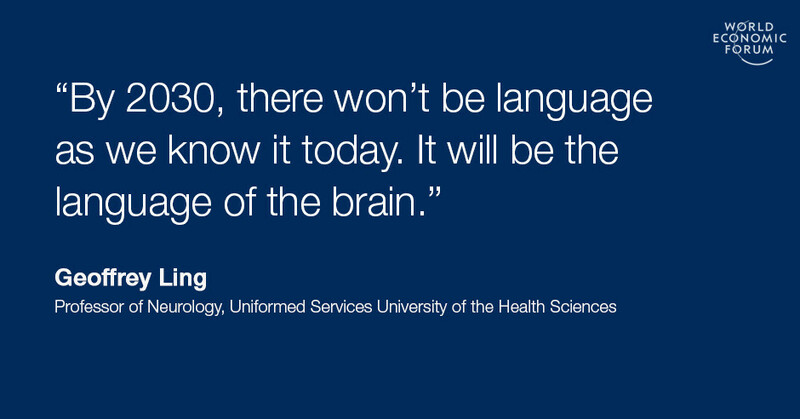 There won’t be language as we know it today, it will be the language of the brain over this platform. In the room right now, there are plenty of things you cannot see or hear because of the body’s limitations. Those could also disappear. Neurotechnologies could give us the ability to expand our spectrum.